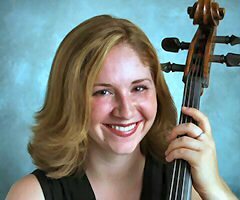 Christina Babich, baroque 'cello, is a native of Akron, Ohio. She began cello studies at age eight under the Suzuki Method and the Northern Ohio Cello Academy. Christina won the 1996 Akron Youth Symphony Concerto Competition, and was a soloist with the University of Akron Symphony Orchestra as result of the 2001 Concerto Competition. She has performed with the Cleveland Orchestra Youth Orchestra, and in master classes given by Steven Isserlis, Second City Musick and the Miami String Quartet. Other coaches include René Schiffer, Reinmar Seidler, Ingrid Matthews, and Cynthia Roberts. Christina was a winner in the 2001 Tuesday Musical Club competition, the winner of the Cleveland Cello Society Competition, and received a fellowship to teach cello at Credo Chamber Music Festival in Oberlin , Ohio . She has attended the Meadowmount Music School as a student of Hans Jensen, the “Cellomania” conference in Atlanta as a pupil of Martha Gerschefski, and the National Orchestral Institute at the University of Maryland . She was instructed in historical performance practice at both the Amherst Early Music Festival, studying baroque cello with John Mark Rozendaal and Rainer Zipperling and viola da gamba with Sarah Cunningham, and at the Tafelmusik Baroque Summer Institute in Toronto to study with Christina Mahler. Christina received a Master’s in Music Performance from the Cleveland Institute of Music with Richard Aaron and is currently studying at Case Western Reserve University for a Doctorate of Musical Arts in Early Music, focusing her studies on the baroque cello, the viola da gamba and the medieval vielle. She has most recently appeared with the Cleveland Chamber Symphony, Citymusic Cleveland, and Apollo’s Fire (The Cleveland Baroque Orchestra).